The big parts make it look pretty, but the small parts help keep your Bronco running and operating smoothly. Our next new product is one of those pieces! This division bar lower bracket and door glass stop keeps your door window in place and rolling up and down just like Ford intended. 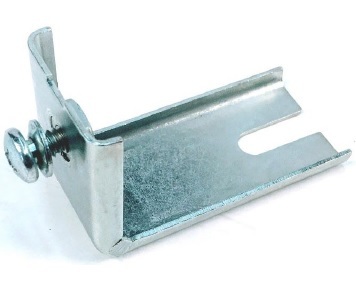 Zinc plated, this bracket fits a 1966-1977 Ford Bronco and includes the screws needed to attach it to the door. These brackets are sold individually, be each door will need two to function properly. Remember, whatever Bronco part or accessory you’re looking for, you can find it here at the Bronco Graveyard. We stock hundreds of the best quality and hardest-to-find parts that will help you maintain, service, and get your Bronco back on the road in perfect working order. And we’re always adding more to our massive catalog so keep checking back to see the batch of exciting new products that you can only find here at the Bronco Graveyard.